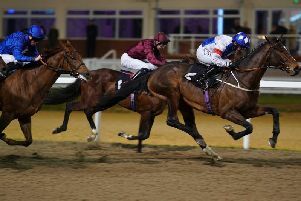 The son of Declaration Of War first struck on only his second career start last March when with William Haggas, and made a triumphant return a month ago on his second run since joining Paul d’Arcy and his first since being gelded. His latest success came over six furlongs and he only got up in the last few strides to deny Kupa River by a neck. He was only put up 2lb and the extra furlong this time could eke out further improvement, making the four-year-old worthy of the nap vote. Ulster has not run at Wolverhampton before but that is not really surprising as the four-year-old has only had three starts. To think he cost Godolphin 120,000 guineas as a foal suggests he ticked every box at that stage, but he has clearly had his fair share of problems as he was restricted to just one run for Saeed bin Suroor. He was cast aside and taken to Tattersalls Autumn Sales, where Archie Watson acquired him for £25,000. That could prove to be a real bargain as he has already started to make up for lost time with two victories at Kempton this year. A rating of 76 for his first handicap could well be a lenient mark. Those wins came up a mile and a half, but the extra two furlongs here should not be an issue as he showed no signs of stopping. He can complete the hat-trick in the Betway Live Casino Handicap. Bay Of Naples can follow up what was a surprise success at Lingfield with victory in the Sun Racing Novice Stakes. The Mark Johnston-trained colt was sent off 14-1 for what looked a decent novice event but shrugged off the opposition with a determined pillar-to-post display. The lack of a recent run should not punters off supporting Barrakilla in the Leicestershire Open Hunters’ Chase at the East Midlands track. The 12-year-old, trained by Fergal O’Brien, makes his first appearance since finishing fourth in the Foxhunters’ Chase at Aintree, so it is safe to assume a spring campaign in that sphere is again the plan. 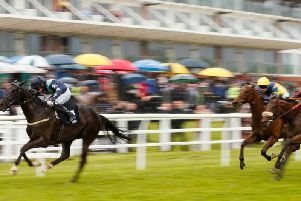 Barrakilla overcame a 746-day absence when successful on his return at Bangor last February and can repeat the trick. Parlour Maid has hit a rich vein of form with wins at Lingfield and Market Rasen in the last couple of months. Richard Hawker’s eight-year-old has only been raised a total of 10lb for those efforts and so looks hard to oppose in the Daniel Lambert Mares’ Handicap Chase. Louis’ Vac Pouch got off the mark first time for Henry Oliver at Ludlow three weeks ago following a 116-day break after leaving the Philip Hobbs yard. The seven-year-old does not look harshly treated as he bids to double up in the Happy 80th Birthday John Jarvis Classic Novices’ Chase at Catterick. Shaman Du Berlais can go one better in the Racing TV Profits Returned to Racing Novices’ Hurdle after having the misfortune to come up against the in-form Uno Mas at Fakenham recently. Delface has his quirks but he has been consistent of late and can reward trainer David Pipe in the Call Starsports On 0800 521 321 Handicap Chase to win at Ffos Las for a second time. CATTERICK: 2.20 Trapper Peak, 2.50 Highland Bobby, 3.20 Louis’ Vac Pouch, 3.50 Shaman Du Berlais, 4.20 Bright Prospect, 4.50 Boruma. FFOS LAS: 2.10 Urtheonethatiwant, 2.40 Top And Drop, 3.10 Delface, 3.40 Precious Cargo, 4.10 Gone Platinum, 4.40 Financier. LEICESTER: 2.00 Parlour Maid, 2.30 Cuddles McGraw, 3.00 Barrakilla, 3.30 Boagrius, 4.00 Midnight Mustang, 4.30 Path To Freedom. WOLVERHAMPTON: 5.00 Sharp Operator, 5.30 Bay Of Naples, 6.00 MARTINEO (NAP), 6.30 Mr Top Hat, 7.00 Ulster, 7.30 Debbonair.